Yemen’s government is willing to accept a UN role in Hodeidah’s seaport, a lifeline for millions of people during the country’s war, but not a long-term presence in the city itself, Foreign Minister Khalid al Yamani said on Monday. Mediator Martin Griffiths, who opened United Nations-sponsored peace talks between Yemen’s warring parties in Sweden last week, wants to avert a full-scale assault on the Red Sea city. The Houthis control most population centers, including the capital Sanaa which it seized in 2014 after ousting the internationally-recognized government of Abd-Rabbu Mansour Hadi that is backed by a Saudi-led coalition. Control of Hodeidah, the Houthis’ main supply line, is one of the trickiest issues at the talks, aimed at paving the way for a political process to end nearly four years of war. Yamani rejected this idea. “The concept of peacekeeping or some sort of permanent presence of the UN — boots on the ground — or making the city as neutral is something that we will never accept,” he said on the sidelines of the talks. Yamani, who heads the Hadi government delegation, said the city should be placed under the control of the interior ministry’s police forces as a matter of sovereignty. However, the government is willing to accept the deployment of monitors from the UN Verification and Inspection Mechanism (UNVIM) in the port, the entry point for most of Yemen’s commercial goods and aid supplies. 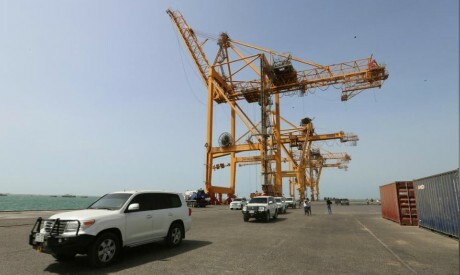 It could also accept the transfer of port revenues to the central bank in Hodeidah instead of routing them to Aden, the Hadi government’s temporary base, the minister said. Another sticking point is a transitional governing body. Hadi’s government insists the Houthis disarm first while the movement says this would require agreement on a unity government and timeframe for the transitional period. “The first step to be taken in order to achieve peace in Yemen is that they should hand back arms, ammunitions and missiles,” Yamani said. The United Nations special envoy to Yemen said on Monday he hopes there will be an agreement by the warring factions to hold another round of talks early next year. There will be a detailed plan for those talks, and the next round will discuss security arrangements, Martin Griffiths said on the sidelines of the Yemen peace talks outside Stockholm. The Sweden-based talks, which began last week, will be the first in many rounds of consultations, he said. Prospects for the talks have risen as Western nations press for an end to the war that has killed tens of thousands of people and left more than 8 million facing famine.